Senior Democratic lawmakers are launching a peremptory strike against a potential Fish and Wildlife Service change in how threatened species are protected. The revisions to what insiders know as the "blanket 4(d) rule" are still in draft form and might never formally surface. The very idea, though, spooks some on Capitol Hill, and that, in turn, opens another front in the perpetual Endangered Species Act dust-up (E&E News PM, April 4). "We fear FWS' intention is actually not to better address the needs of threatened species, but rather to cater exclusively and completely to oil, gas and agricultural industries that must currently avoid harming species and their habitats," two Democrats wrote to Interior Secretary Ryan Zinke on Friday. Underscoring their broader political message, Rep. Raúl Grijalva (D-Ariz.) and Sen. Tom Carper (D-Del.) cited the "track records" of acting Assistant Secretary Susan Combs, who the Democrats say is "known to have strong ties to ranching and oil industries," and Deputy Secretary David Bernhardt, who the Democrats say has "a long record of advocating to weaken the Endangered Species Act." Grijalva is the senior Democrat on the House Natural Resources Committee, and Carper is the party's ranking member on the Senate Environment and Public Works Committee. The lawmakers oppose a proposed "Removal of Blanket Section 4(d) Rule" that was submitted last month for the White House Office of Management and Budget to review. The ESA prohibits the "take" of species designated as endangered — myriad actions including those that "harass, harm, pursue, hunt, shoot, wound, kill, trap, capture, or collect" a species. Section 4(d) of the law allows the agency to establish special regulations for threatened species. In 1978, FWS used this authority to extend the prohibition of take to all threatened species. This is known as the "blanket 4(d) rule." This blanket rule can be modified by a species-specific 4(d) rule. Currently, for instance, FWS is considering a proposal for a 4(d) rule specifically tailored for the threatened Louisiana pine snake (Greenwire, April 5). The snake inhabits open-canopy forests with a lot of ground-cover plants that provide forage for the Baird's pocket gopher. The snakes eat the gophers. In the absence of fire or mechanical thinning, dense forests become less hospitable. Private-property owners worried they might be blocked from forest thinning if all taking of the Louisiana pine snake was absolutely prohibited, so FWS wrote a rule that allows for some potential short-term take of snake or habitat. "Weyerhaeuser is appreciative of the Service's work to create a 4(d) rule that takes into account the needs of forest landowners to continue to manage their properties," the timber products company stated Friday during the pine snake public comment period that expires today. Conservatives and private-property advocates have previously sought to scale back the broader, blanket 4(d) rule, with the Pacific Legal Foundation filing a petition in August 2016 on behalf of the Washington Cattlemen's Association. "That regulation erodes the distinction between endangered and threatened species," the petition stated, adding that it "creates an incentive for litigation." FWS says it is moving prudently, along with other federal agencies. 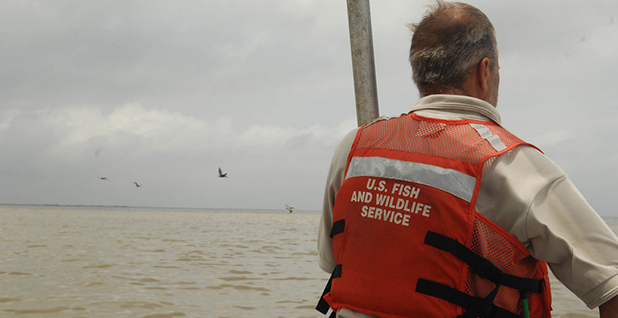 "NOAA Fisheries and the Fish and Wildlife Service are working to develop regulations that improve our implementation of the ESA so that it is clear, unambiguous, consistent and flexible to the greatest extent possible, and encourages collaborative conservation from a broad range of partners," FWS spokesman Gavin Shire said in a statement. In a copy of the potential rule obtained by E&E News, FWS officials also stress they are looking at future actions rather than reversing prior decisions. "Nothing in these proposed revised regulations is intended to require ... that any previous listing, delisting, or reclassification determinations or species-specific protective regulations be reevaluated on the basis of any final regulations," the proposed rule states.